Tell us about yourself: Hi there. Still we mountain bike, hike, cross-country ski and my husband runs. I walk in the woods with the dogs 3 times a day and we are lucky to have US Forest right out the door. So that is it. We get a lot of inquires from people asking if their brindle dog is a Dutch Shepherd or Dutch Shepherd mix. Here are other breeds that could be the source of the brindle pattern. Brindle does not equal Dutch Shepherd. Here is a list of breeds that can be brindle. I patched this together from on- line sources. Please add to it or corrected as I don't claim to be an expert. Wait--but what if it has pointed ears? SURELY if it's brindled and has pointy ears it's a DS. No? Huh. Well, what if it's brindled, has pointy ears, and helps my kid with his homework? That's definitely a Dutch, right? Sarcasm aside, thank you, Karin, for the post. Really, though, there is just way too much information out there as to characteristics and then mix them, now you have that much more. Hounds act this way, working breeds act that way, and herding breeds another way. Honestly, it really dosnt matter, I have two and they are at the opposite ends of the spectrum as far as characteristics so with in the same breed there are differences, so now you have who knows what and asking what kind of dog you have makes for a too loaded question. Love each other and at the end of the day, breeding dosnt matter. Dutchringgirl wrote: Love each other and at the end of the day, breeding dosnt matter. Tell us about yourself: I am a partnered male who spends my time caring for my ailing mother. I was angry when my sister told me she brought home a stray puppy (I live with her), But upon meeting Ginger my heart melted. I loved my Valkyrie so much (A german shepherd Rott mix), I never thought I would meet a dog so sweet, smart, and beautiful, but there she was. I have no papers but I thing Ginger is the dutchiest dutchess in dutchland. Hey, you all forgot the Cimarron, I thought I had something here with trying to match Ginger but upon more research ears are all wrong even if they can stick up sometimes, along with many other differences..
Tell us about yourself: My name is Emily. I am the mother of two girls (human!!). We have one beagle named Charlie who is three and a new puppy named Asha. She is about 9 weeks old and we think she is a Dutch Shepherd Dog mix. I thought I read somewhere that bridle was the dominant color "gene", is this true? There have been a few other talks of the coloring on here that are pretty informative. Do a search and see what you can come up with. i had not the slightest idea that Anatolian shepherds could be brindle. could be an answer to the question about Rufus! Oh my, you may be right, Johnny! Some of the other breeds I've been looking at resemble him...but he's almost a spitting image of many of the images I've looked at of the Anatolians! Would definitely explain his size, and he really is a gentle giant! ALOT of the stuff I just read about them Rufus fits to a "T". Wow. @Karin, I think this post is wonderful. Honestly, I never knew there were so many brindle breeds that could be an influence! In loving memory of Maiya, the best Dutch Shepherd. 2012-2013. At 14 months old, you had yet to live life to it's fullest. You touched our lives and will never be forgotten. We have a new member, Carolinagirl, who has a DS but also has two Anatolians. Not saying your Rufus is the latter; just letting you know that you may have a source of information for Anatolians on this site with a PM, keeping in mind that no one has a crystal ball. Raven wrote: We have a new member, Carolinagirl, who has a DS but also has two Anatolians. Not saying your Rufus is the latter; just letting you know that you may have a source of information for Anatolians on this site with a PM, keeping in mind that no one has a crystal ball. Oh, definitely. That is good to know! I looked a bit closer, and did come across 2 Anatolian breeders within a 1 1/2-2 hour radius of the shelter we got Rufus. So, it's entirely possible, even if he's a mix of one of those and something else. We don't care one way or another what he is, it's more of random curiosity, and fun, to try to figure out something that he /may/ be. He's way too big and his proportions just don't fit a Dutch. I got a bit excited researching them to see something he looks almost exactly like. Maiya on the other hand was 100% Dutch. Miss that girl She and Rufus would have been a BLAST together. Maiya. I remember. Maiya lives on, though. No doubt. Enjoy Rufus and the new year together. Raven wrote: Maiya. I remember. Maiya lives on, though. No doubt. He is exactly like her in so many ways. It's awesome So no, it doesn't sound nuts! 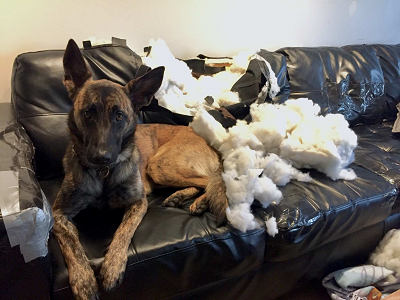 Tell us about yourself: I just got a rough coated Dutch shepherd pup a few days ago and am looking forward to learning more about this great breed! I also have sheep,dexter cattle,two Anatolian shepherd livestock guardian dogs, an Amstaff (who is thrilled to finally have a friend to play with) and two elderly long coated chihuahuas. It's true that Anatolians do come in Brindle but that color is very, very uncommon within the breed. I know of only a few of them. Most are fawn dogs with black masks. A large boned brindle mix is more likely great Dane or Mastiff or something like that. temperament wise, Anatolians are at the opposite end of the spectrum frm herding dogs. They lack prey drive.....but do have a protection drive. They don't play like regular dogs either and are VERY independent thinkers and not very obedient. They are very smart but do not follow commands because they don't really see the point. They are poor schutzhund prospects because they do not see the point of attacking someone who really isn't a threat. So if a dog acts like a Dutch shepherd, it's very unlikely it has any Anatolian blood. Very early on in the life of the forum there was a post where Judith (I'm pretty sure it was her) put together a list of Brindle breeds. Also when trying to determine heritage of mixed breed dogs, think of what breeds are common to your area. If a breed is very rare in the area, chances are the owner of those breeds is not letting them roam around producing strays. In my my area, a brindle mixed breed is probably a boxer or pit bull mix. I am probably the only person in a 50 mile radius with Anatolians. But out west and in Texas, there are hundreds of them. So if a large fawn colored stray shows up at my local shelter, I'd bet $100 it is NOT an Anatolian mix. Shelters love slapping fancy names on stray dogs, I guess they think it helps get them adopted.